The Oilholic finds himself gazing at the bright lights of Las Vegas, Nevada once again after a gap of five years. This gambling hub's uniqueness is often the ostentatious and loud way it goes about itself. The oil market had its own fair share of loud and exaggerated assumptions last week. Sample these headlines – “Brent spikes to 2015 high”, “Oil markets rally as shale production drops”, “Brent up 10%.” There is some truth in all of this, and the last one is technically correct. Brent did close last Friday up 10.03% relative to the Friday before, while WTI rose 8.41% and OPEC's basket of crude oil(s) rose 10.02% over a comparable period (see graph blow right hand corner). Bullish yes, bull run nope! This blogger believes market fundamentals haven't materially altered. There is still too much crude oil out there. So what's afoot? Well, given that one is in a leading gambling hub of world, once 'the leading one' by revenue until Macau recently pinched the accolade, it is best to take a cue from punters of a different variety – some of the lot who've been betting on oil markets for decades out of the comfort of Nevada, but never ever turn up at the end of a pipeline to collect black gold. Their verdict – those betting long are clutching at the straws after enduring a torrid first quarter of the year. Now who can blame the wider trading community for booking a bit of profit? But what's mildly amusing here is how percentages are interpreted by the media 'Las Vegas size', and fanned by traders "clutching at the straws", to quote one of their lot, 'Las Vegas style'. 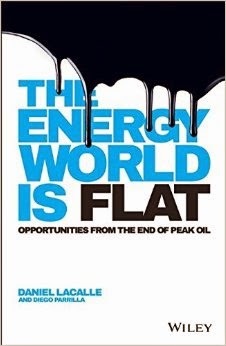 For the moment, the Oilholic is sticking one's 2015 forecast – i.e. a mid-year equilibrium Brent price of $60 per barrel, followed by a gradual climb upwards to $75 towards the end of the year, if we are lucky and media speculation about the Chinese government buying more crude are borne out in reality. The Oilholic remains sceptical about the latter. Since one put the forecast out there, many, especially over the last few weeks wrote back wondering if this blogger was being too pessimistic. Far from it, some of the oldest hands in the business known to the Oilholic, including our trader friends here in Las Vegas, actually opine that yours truly is being too optimistic! The reasons are simple enough – making assumptions about the decline of US shale, as some are doing at the moment is daft! Make no mistake, Bakken is suffering, but Eagle Ford, according to very reliable anecdotal evidence and data from Drillinginfo, is doing pretty well for itself. Furthermore, in the Oilholic’s 10+ years of monitoring the industry, US shale explorers have always proved doubters wrong. Beyond US shores – both Saudi and Russian production is still marginally above 10 million bpd. Finally, who, alas who, will tell the exaggerators to tackle the real elephant in the room – the actual demand for black gold. While the latter has shifted somewhat based on evidence of improved take-up by refiners as the so called “US driving season” approaches, emerging markets are not importing as much as they did if a quarter-on-quarter annualised conversion is carried out. Quite frankly, all eyes are now on OPEC. Its own production is at a record high; it believes that US oil production won’t be at the level it is at now by December and its own clout as a swing producer is diminished (though not as severely as some would claim). Meanwhile, Russian president Vladimir Putin declared the country's financial crisis to be over last week, but it seems Russia’s GDP fell between 2% to 4% over the first quarter of this year. The news caused further rumbles for the rouble which fell by around 4.5% last time one checked. The Oilholic still reckons; Russian production cannot be sustained at its current levels. That said, giving credit where it is due – Russians have defied broader expectations of a decline so far. 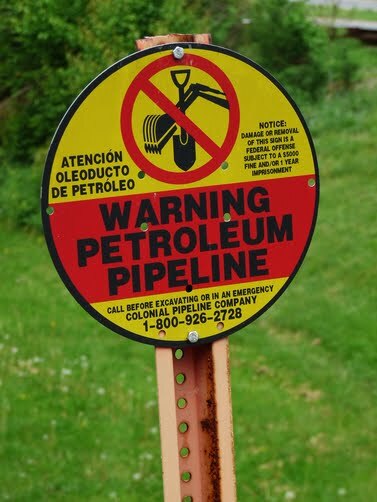 To a certain extent, and in a very different setting, Canada too has defied expectations, going by separate research put out by BMO Capital and the Canadian Association of Petroleum Producers. Fewer rigs in Canada have – again inserting the words 'so far' – not resulted in a dramatic reduction in Canadian production. Finally, here's an interesting report from the Weekend FT (subscription required). It seems BP's activist shareholders have won a victory by persuading most shareholders to back a resolution obliging the oil major to set out the potential cost of climate change to its business. As if that's going to make a difference - somebody tell these activists the oil majors no longer control bulk of the world's oil – most of which is in the hands of National Oil Companies unwilling to give an inch! That's all for the moment folks from Las Vegas folks, as the Oilholic turns his attention to the technology side of the energy business, with some fascinating insight coming up over the next few days from here. In the interim, keep reading, keep it ‘crude’! © Gaurav Sharma 2015. 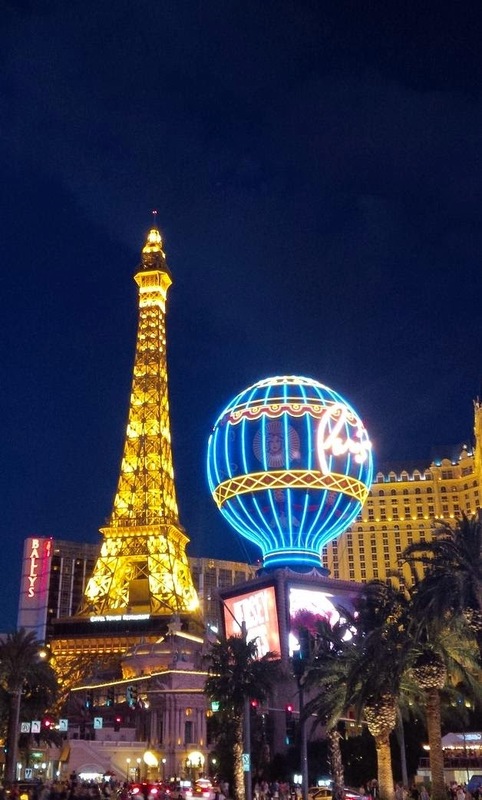 Photo: Paris Casino on the Las Vegas Strip, Nevada, USA © Gaurav Sharma, April 2015. 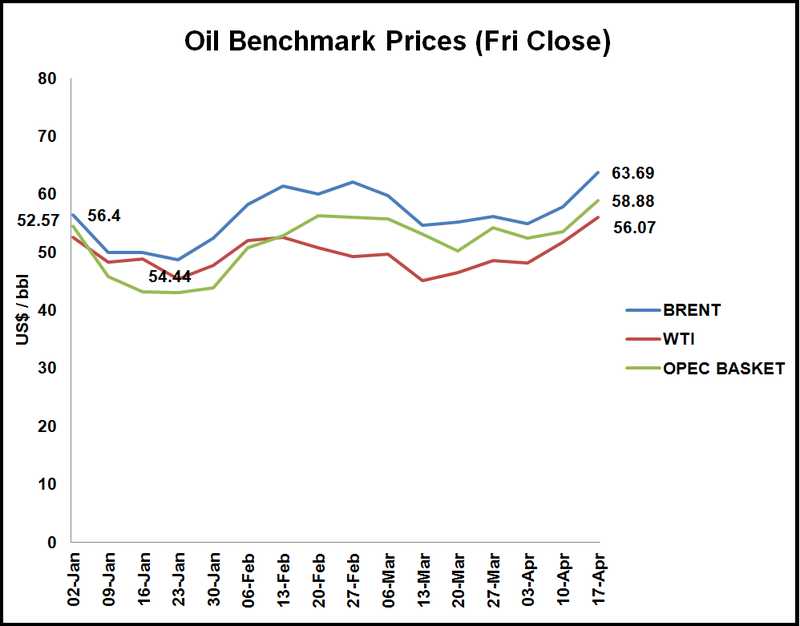 Graph: Oil benchmark prices - latest Friday close © Gaurav Sharma, April 17, 2015. In case you have been away from this ‘crude' planet and haven’t heard, oil major Royal Dutch Shell has successfully bid for its smaller FTSE 100 rival BG Group in a cash and shares deal valuing the latter at around £47 billion (US$70 billion). While it’s early days into the current calendar year, the deal, subject to approval by shareholders, could be one of the biggest of 2015 producing a company with a combined value of over £200 billion. For the Anglo-Dutch oil major, BG Group's acquisition would also add 25% to its proven oil and gas reserves and 20% to production capacity, along with improved access to Australian and Brazilian prospects. BG Group shareholders will own around 19% of the combined group following the deal. BG Group's new chief executive Helge Lund, who only took up the post last month, will remain with the company while the deal is being worked on. However, he is expected to leave once it is completed walking away with what many in the City reckon to be a £25 million golden goodbye. The Oilholic thinks that’s not too bad a deal for what would come to little over three months of service. BG Group shareholders, who’ve had to contend with a lacklustre share price for the last 12 months given the company’s poor performance, can also expect a decent windfall should they choose to sell. The bid values BG at around 1,350p per share; a near 50% premium to its closing price of 910.4p on Tuesday. If they decide to hold on to their shares, they’d be likely to receive an improved "Shell of a dividend" from a company that has never failed to pay one since 1945. Shell chief executive Ben van Beurden said, "Bold, strategic moves shape our industry. BG and Shell are a great fit. This transaction fits with our strategy and our read on the industry landscape around us." The market gave the news a firm thumbs up. Investec analyst Neill Morton said BG’s long-suffering shareholders have finally received a compelling, NAV-based offer while Shell’s bid was arguably “20 years” in the making. “We agree that BG’s asset base is better suited to a larger company, but the economics require something approaching Shell’s $90/bl assumption. Consequently, we do not expect a rival bid and are wary of this catalysing a flurry of copycat deals. But we are also mindful that investment bankers can be very persuasive! We suspect Shell aims to re-balance dividends versus buybacks over the long-term. This could imply lower dividend growth,” he added. As for the ratings agencies, given that the deal completion is scheduled for H1 2016, and quite possibly earlier given limited regulatory hurdles, Fitch Ratings placed Shell's ratings on Rating Watch Negative (RWN) and BG Group's ratings on Rating Watch Positive (RWP). The agency aims to resolve the Rating Watches on both companies pending the successful completion of the potential transaction and “once there is greater clarity with regard to Shell's post-acquisition strategy and potential synergy effects.” We’re all waiting to hear that, although of course, as Fitch notes – Shell's leverage will increase. Moody’s has also affirmed its Aa1 rating for Shell, but quite like its peers changed the company’s outlook to negative in the interim period pending the completion of the takeover. Meanwhile, some City commentators have speculated that Shell's move might trigger a wave of M&A activity in the oil and gas sector. However, the Oilholic remains sceptical about such a rise in M&A. In fact, one is rather relieved that the Shell and BG Group saga would cool nonsensical chatter about a possible BP and Shell merger (oh well...there's always ExxonMobil). They’d be the odd buyout or two of smaller AiM-quoted independents, but bulk of the activity is likely to remain limited to asset and acreage purchases. Of course, consolidation within the sector remains a possibility, but we are too early into a cyclical downturn in the oil market for there to be aggressive overtures or panic buying. However, 2016 could be a different matter if, as expected, the oil price stays low. Moving away from the Shell and BG show, here is one’s take via a Forbes column on how oil markets should price in the Iran factor, following the conclusion of pre-Easter nuclear talks between the Iranians and five permanent members of UN Security Council plus Germany. Additionally, here’s another one of the Oilholic’s Forbes posts on why a decline in US shale activity is not clear cut. As it transpires, many shale producers are just as adept at coping with a lower oil price as any in the conventional industry. That’s all for the moment folks! Keep reading, keep it ‘crude’!